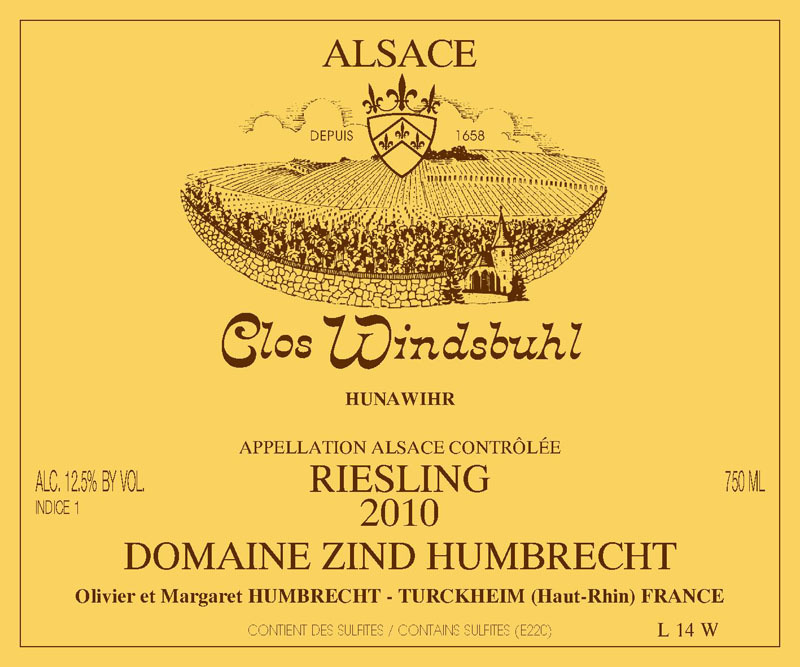 The Clos Windsbuhl is located in a late ripening area in Alsace, capable to keep extraordinary structure while allowing the grapes to reach full physiological ripeness. The higher altitude and poor limestone soil increase this characteristic. The Windsbuhl Riesling was the last Riesling harvested on the estate and the grapes still remained very healthy. In 2010, the Windsbuhl also flowered just after the cold period in June, which means that we suffered much less from grape loss in this vineyard. Being less precocious is not a problem if the vines are located in a vineyard that has a good exposition (south facing) and good drainage (steep slope and rocky soil). Despite the normal ripeness, this wine took also a long time to ferment. 3/2012: nothing in the nose could prepare to the severity of this wine. The aromas are very classic: light stony, some lees effect (light toast), fresh citrus fruits and classic ‘mineral’. The first palate is delicate and very refined, but gradually the acidity and structure show. This wine has an amazing crisp tension, lots of minerality and a long finish. Beware; this is a very dry wine! And, please, keep it as long as possible before drinking it.